As issue 5 of Turnstile Blues is coming out very soon – and is on sale at Portman Road on Saturday, 3rd May 2014 – I’m posting some of my favourite pieces from the previous four issues in an effort to show you what we’re about. First, a particular favourite from our first issue, by Gavin Barber. A few years ago, Heinz announced that they might have to stop making salad cream because everyone was buying mayonnaise instead. “Imagine that!” exclaimed a woman I worked with at the time, “no salad cream in the shops!”. “But hardly anyone’s buying it”, I replied, “do you actually buy it yourself?”. “Well, no”, she admitted, “but it’s nice to know it’s there”. There was, of course, a subsequent mad rush on the purchase of salad cream and the product was saved. The whole thing was probably just a clever marketing ruse by Heinz, tapping into a basic truth: there are some things that comfort us simply by their continued existence in the background of our lives, whether it’s the presence of a condiment on the supermarket shelves, the smell of the coffee stall we pass on the way to work or the continued international career of Dennis Rommedahl. They don’t make much real difference to us, but we’d miss them if they weren’t there. Does Ipswich Town fall into this category? I started thinking this when I was challenging myself to work out exactly why the bloody hell I had been so determined to pass the Portman Road habit on to my son. Was I handing down a precious gift, a timeless expression of parental love with value beyond measure? Or was it more like one of those irritating hereditary quirks such as premature baldness or eczema? My Dad was a much better and more responsible parent than I am. He followed Ipswich himself and would respond cheerfully to all my questions about them, but never made any particular effort to foster my interest, perhaps sensibly deciding that if I wanted to open myself up to the same lifetime of frustration as he’d had, then it was my own lookout. Of course, it wasn’t long before I was pleading with him to take me along: the idea of actually going to Portman Road held the sort of allure for me that Disneyland had for other kids. Even then, I think Dad was a bit surprised, and not really convinced that I’d like it as much as I thought I would, but of course, when I eventually did make it through the turnstiles I was irretrievably hooked. I wasn’t allowed to go every week but I’d mark on the fixture list the games that Dad had said I could go along to (this being the early 80s, these were mostly determined on the basis of having the lowest hooligan risk) and these, like Prufrock’s coffee spoons, would become the punctuation marks of my young life, each one as eagerly and as long anticipated as the last, regardless of how Town were playing at the time. Often we’d go with my extended family – my Grandpa, who always seemed to think it was cold and who judged each new signing according to whether or not they were as good as Tommy Parker (they never were), and my Uncle, who loved the Dutch players and whose own moustache I imagined to be his personal tribute to Frans Thijssen. I could disappear at this point into a quicksand of clichéd reverie, but I’m sure you get the picture: the boy in a man’s world; the always-lingering cigarette smoke; above all, the excitement of Christmas fixtures and the massed ranks of pocketed hands afterwards as the crowd shuffled, heads bowed against the biting winter wind, towards their trains and buses and cars and the New Year. course not. The poor child has ITFC-branded tat shoved in his face from day one. Babygros, teddies, woolly hats, the lot. His baby bouncer pointed towards the screen for televised Ipswich games, in the hope that some formative connection will be made. Ostentatious attempts at bonding, even while the child is still in nappies: “Daddy’s off to football now! At Ipswich! I expect you’ll be wanting to come with me soon? Won’t you? Won’t you? Won’t you?” It was the sort of evangelistic approach that the Jesuits might regard as being a bit extreme. In any case, it worked: he did start wanting to come along and now, at the age of 8, he’s a season ticket holder with me in the West Stand. We make the long journey by train, we have fun on the way, meet up with friends for lunch, watch the game, and then relax again on the train home. By that stage, the effects of a long day’s travelling and socialising can be taking their toll, but he usually wakes me up when we get to Liverpool Street. Lazenby-Gates? Is it something that provides reassurances just because it’s there? If so, all well and good, but couldn’t I have kept it to myself? I think the answer is that it’s more. It’s about maintaining a family tradition, but not just for it’s own sake – it’s because there is something about Ipswich Town as a club, as an entity, that can – in amongst all the frustration – bring moments of great joy and community. 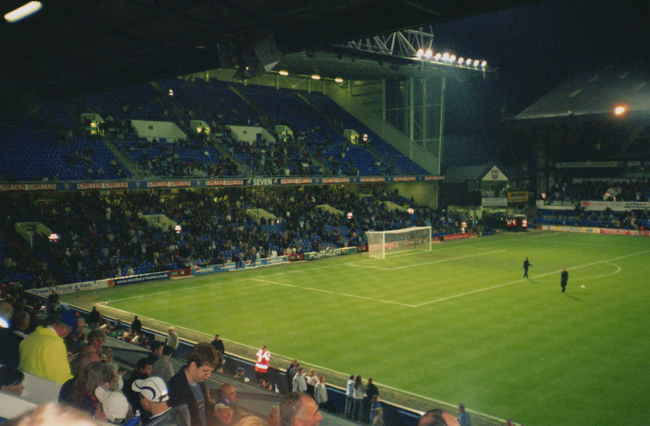 One of the things that always impressed me as a child about matchdays was that, no matter how mundane the fixture, the game was always, unquestionably, the most exciting and important thing happening in Ipswich that day. And in that way it brought people together and was a force for good. There are many other football clubs whose fans would say exactly the same, and they’d be right too. Change, like death, taxes and the UK’s annual poor showing at Eurovision, is inevitable. Over time, players, managers, kits and even the physical structure of the ground itself are altered until they’re almost unrecognisable from those you grew up with. But something remains at the heart of the club that transcends all this. It’s the fans, basically – the togetherness, the humour, even the traditional Portman Road moaning – that make our club a special one: and that’s why we want to hand it on to our kids. We’re not only giving them a gift, we’re preparing the way for them to take their own turns at its stewardship, just by being there. I’m not at all sure that Marcus Evans and Simon Clegg [This was first published a couple of years ago. – Ed.] get this. Their approach seems distant, a sort of “you let us get on with running the football club and we’ll paint the turnstiles occasionally so that you know we haven’t forgotten about you”, missing the point that we – like our parents and grandparents before us, and hopefully our children after us – are the football club. Clegg and Evans are people who happen to have functional roles for the moment, but one day they’ll be gone and we, the fans, will still be here. But I think I can still justify my zealous approach to my son’s upbringing. That stuff that made me want to share it with him in the first place – the spirit of community – is still there. These days it’s not just in the pre-match pubs and in the ground itself, but it’s on Twitter and the message boards too, and is all the more fun for that. This isn’t, then, about tradition for its own sake. It’s not like the outraged howls of protest at proposed changes to the Radio 4 schedule, made by people who never listen to Radio 4. It’s not just sitting in your favourite seat on the bus to work. It’s worth preserving because Ipswich Town stands for something. It’s up to us to do that preservation and right now it feels like we’re doing it in spite of the owner and the Chief Exec, rather than with them. Without meaning to, he’d pulled me round in an instant, from a rapidly darkening mental state to a realisation that actually, yes, if we can only see the world through a child’s eyes then there is always something to take comfort in, whether it’s seeing your favourite player scoring or simply that there’s another game next week. When it comes to ITFC I’ve got big concerns about the present, but I’m learning to put my faith in the future. This entry was posted on Tuesday, April 29th, 2014 at 5:05 pm and is filed under Football, Ipswich Town Football Club. You can follow any responses to this entry through the RSS 2.0 feed. You can leave a response, or trackback from your own site.